Mary Norris has been a copy editor at The New Yorker for more than thirty years. In that time, she has interacted with some (in)famous writers and editors and learned about the many steps that are necessary before going to print. Between You And Me is the story of her life from checking feet at a local pool (yes really) to becoming the beloved comma queen of one of America's most respected magazines. But Norris is not a stodgy grammarian detailing her life alongside the rules and regulations of writing. She brings joy and laughter to the sometimes bizarre standards of writing and editing and freely confesses her love of a good pencil and the occasional well-placed profanity. 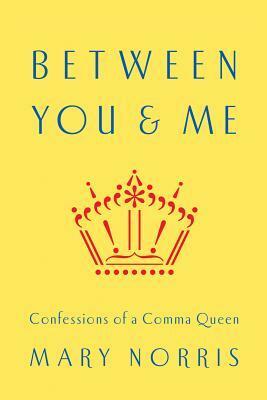 Between You And Me is a book I would recommend wholeheartedly to so many kinds of readers - reader who are also writers, those who are interested in what happens behind the scenes of The New Yorker, reader who are nuts about grammar, and those who enjoy learning from a fascinating and funny teacher. I think this is a book I will enjoy. I will have to add it to my TBR list. I really liked this book, too... listened to the audio version narrated by the author. This sounds like it could be fun. I like books about translation and I'd consider books about other aspects of language as well, although I have trouble getting over the fear that grammar will be boring!